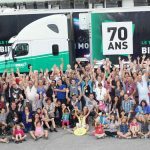 QUÉBEC, October 6, 2014 – Last September, during National Trucking Week, Transport IDÉAL seized the opportunity to launch its new image. Some trailers are already showing the new visual. Intended to be more dynamic and modern, this new image representing the Earth shows that IDEAL is not limited by frontiers. Thanks to its Logistics service, the company can arrange for the transportation of goods anywhere around the globe and through all modes of transportation. Transport IDÉAL was founded in Québec City in 1945 by Mr. Antonio Pettigrew. In 1966, a second warehouse was added, bringing the total warehousing surface area to more than 100,000 square feet. In 1997, Logistique IDÉAL Inc. is created in order to offer complete merchandise logistics. This company complements Transport IDÉAL Inc. and Entrepôt IDÉAL Inc. In 2012, the company extends its services to Montréal and in 2004, a second warehouse is added. In 2011, IDEAL settles in a brand new distribution center in Québec City, becoming the main warehousekeeper in Québec City’s alimentary products industry. This is a major step for the company which now holds over 11.5 million cubic feet of warehousing space for dry goods and 420,000 cubic feet of refrigerated warehousing space. Today, IDEAL is getting ready since it will celebrate its 70th anniversary in 2015. Over the years, four generations have succeeded each other at the head of the family business which offers warehousing, transportation and logistics services adapted to the needs of its customers. Whether it be by road, ship, plane or train or a combination of these methods of transportation, IDEAL can accommodate you throughout the world. The company also offers support when it comes to packaging in accordance with international standards and custom-related documents. IDEAL experts provide integrated and flexible solutions perfectly tailored to the many issues related to stock management.